Home / Uncategorized / Trendy…. The new hype Black and White. It has been a hype for a while now but I am used to being late. I usually need some time to adjust. Although I am not so sure how I feel about dressing my kids in black and white all the time. For me kids mean color. Kids mean Joy. Black to me is a serious color. But from time to time I think it is beautiful. The fabric in this Semper Sweater are sponsored by Droomstoffen. She has a beautiful collection of black and white fabrics for you to choose from. I love the prints she has chosen for her shop. Seriously, go check it out. I choose the black panda fabric and combined it with another black geo print. And you know what, it is one of my favorite Semper Sweater dresses I sewed. So, now a days all I sew is the Semper Sweater. I sewed 10! But all for a good cause. I like to test a pattern and all of the changes I make to it myself first. The main reason to that is that I do not want to sell a pattern, that I will not sew for my own littles. So yes, 10 Semper Sweaters it is….. This version is the latest one I sewed. 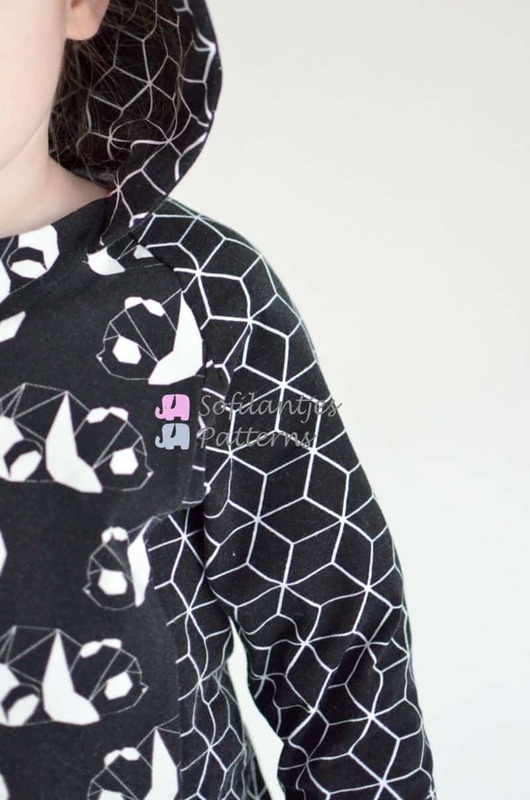 It has the new hood and mini dress add-on, that will be a free addition for this pattern. You’ll also be able to use the free pattern pieces on the Omni Tempore pattern. The pattern will release after Easter, so make sure you are back online after you found all your easter eggs…. Sale is Short and Sweet! If you are not in the group yet, come on over! Next post: Happy Birthday, Anne!!! I agree, the fabrics (most of them) are printed with a cute print. Super combinatie, deze twee stofjes!